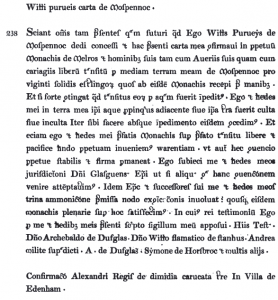 Witti Purueis carta de Mospennoc (or in English William Purveys of Mospennoc) is named in Liber Sancte Marie de Melros in charter 238 during the reign of Alexander II (1214-1249), the actual date is unknown as the charters are not dated just linked to the King, however the witness, Sir Archibald of Douglas, status suggests it was shortly after 1226 [DN: The Douglas Book Vol 1 p44-45]. On William’s seal was a horn, no coat of arms and “sigitt witti purvis”. The charter is witnessed by Sir Archibald of Douglas “Domino Archebaldo de Dufglas” (the second known of Douglas, 1st being William), another witness to this charter was Andrew, knight, or man-at-arms of Archibald of Douglas, and the fact of his being attended by his own knight shows the influential position which Sir Archibald had acquired and also the position of William Purveys and relationship with the early Douglas’ – a relationship which is to span many centuries. The Latin phrase “carta” means charter and signifies that William has a Royal Charter for the land of Mospennoc and as such is a Tenant-in-Chiefin capite or tenant-in-chief, sometimes vassal-in-chiefin capite or tenant-in-chief, sometimes vassal-in-chief , denoted the nobles who held their lands as tenants directly from king or territorial prince to whom they did homage, as opposed to holding them from another nobleman or senior member of the clergy. Other names for tenant-in-chief were captalin capite or tenant-in-chief, sometimes vassal-in-chief , denoted the nobles who held their lands as tenants directly from king or territorial prince to whom they did homage, as opposed to holding them from another nobleman or senior member of the clergy. Other names for tenant-in-chief were captal or baronin capite or tenant-in-chief, sometimes vassal-in-chief , denoted the nobles who held their lands as tenants directly from king or territorial prince to whom they did homage, as opposed to holding them from another nobleman or senior member of the clergy. Other names for tenant-in-chief were captal or baron.. or baronin capite or tenant-in-chief, sometimes vassal-in-chief , denoted the nobles who held their lands as tenants directly from king or territorial prince to whom they did homage, as opposed to holding them from another nobleman or senior member of the clergy. Other names for tenant-in-chief were captal or baron.. , denoted the nobles who held their lands as tenants directly from king or territorial prince to whom they did homage, as opposed to holding them from another nobleman or senior member of the clergy. Other names for tenant-in-chief were captalin capite or tenant-in-chief, sometimes vassal-in-chief , denoted the nobles who held their lands as tenants directly from king or territorial prince to whom they did homage, as opposed to holding them from another nobleman or senior member of the clergy. Other names for tenant-in-chief were captal or baronin capite or tenant-in-chief, sometimes vassal-in-chief , denoted the nobles who held their lands as tenants directly from king or territorial prince to whom they did homage, as opposed to holding them from another nobleman or senior member of the clergy. Other names for tenant-in-chief were captal or baron.. or baronin capite or tenant-in-chief, sometimes vassal-in-chief , denoted the nobles who held their lands as tenants directly from king or territorial prince to whom they did homage, as opposed to holding them from another nobleman or senior member of the clergy. 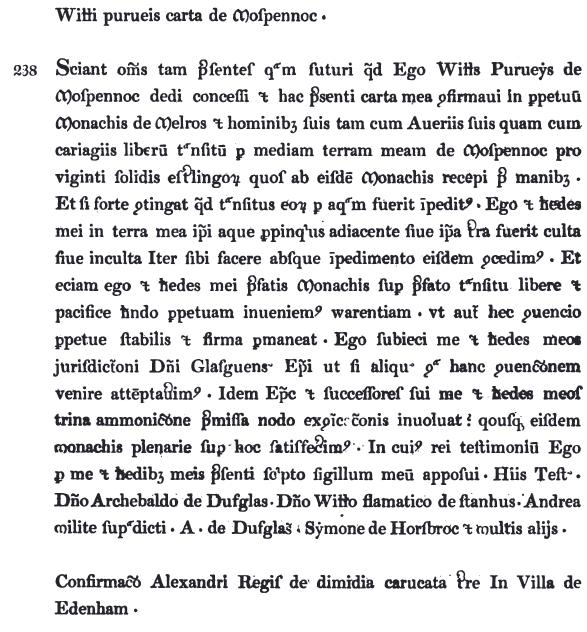 Other names for tenant-in-chief were captal or baron.. (or Vassal) to Alexander II (see Feudalismis a set of reciprocal legal and military obligations among the warrior nobility, revolving around the three key concepts of lords, vassals and fiefs (click for more)) – he is probably a high ranking Knight rather than feudalis a set of reciprocal legal and military obligations among the warrior nobility, revolving around the three key concepts of lords, vassals and fiefs (click for more) Baronin capite or tenant-in-chief, sometimes vassal-in-chief , denoted the nobles who held their lands as tenants directly from king or territorial prince to whom they did homage, as opposed to holding them from another nobleman or senior member of the clergy. Other names for tenant-in-chief were captal or baron.. Many of these Knights are Norman’s of the ‘younger son’ variety who sought fortune in Scotland during David I reign although others where younger sons from Fleming in later years [DN: more detailed required]. Mospennoc is in a very strategic position on one of the two main roads in the West from England to Scotland – William clearly controlled this road for the King as well as managing the estate surrounding. It must have been a pretty exposed position in those days. A William (probably his son) is then named in the Ragman Rolls in 1296 as “William Porneys – tenauntz le Roi du counte de Pebbles” – a Royal Vassal in the County of Peebles. Although also in the Ragman Rolls is ‘John Eyr of Messfennon’ as such it seem the family has moved on though still within the Peebles area. Of note only 89 of the 2,000 signatures are “tenauntz le Roi“ 13 of which are from the Peebles area. One Response to "William Purveys of Mospennoc"